With the skintone correcting moisturiser, 95% said skin felt softer, smoother – instantly. By night, it infuses skin with intense moisture. Soothes and calms irritation. By day, it maintains skin’s ideal moisture balance to help defend against future dark spots. Formulated with targeted skin brighteners and powerful antioxidants and anti-irritants. How to use: Apply AM and PM after Enlighten Serum. I was excited to receive the products as part of the Trial Team, as dark spots are exactly the problem I am trying to combat! Although I have only been using the product for the last 5 days, I have to say that there is a slight difference in the dark areas, particularly under the eyes. Unfortunately nobody else has noticed it, but I doubt I have been using it long enough for others to notice. What I like about the products is the fact that it is easily absorbed – something that is an absolute must for me when deciding on any beauty products. I still have about 2 days’ worth of products left, from the 5ml samples we were given, so it definitely looks like it can last. However, I am not sure of the retail price, so I can’t comment if it is “value for money” just yet. 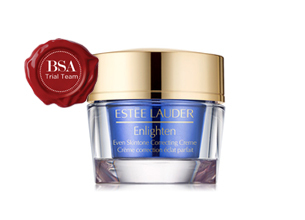 The Estée Lauder Enlighten Crème is thick and luxurious, and was an absolute pleasure to apply! I have very dry skin, so I am always keen on thick and hydrating night cream and this landed in my hands at the right time. The change in season to winter is always tough on my skin, and this cream is making the transition that much easier. The texture is smooth and luxurious and feels great on application. I noticed that my skin was visibly clearer and I was left with a glowing complexion and hydrated skin. If you are looking for a product to revive your skin and help with dullness and uneven skin tone – then this is the product for you! Since using the Estée Lauder Enlighten Even Skintone Correcting Crème, the texture and appearance of my skin looks less flawed. I have a lot of blemishes from teenage acne and sun spots. I am in the sun for a good part of the day and noticed that this weightless formula has made a great impact on the appearance of these spots. The bottle is small enough to pop into your make-up bag and is best applied at night. I will continue using the product as I would like to see how it further repairs my skin. I highly recommend this product, as not only is it fast acting but leaves a long-lasting effect on my skin. I feel so confident that I have stopped applying foundation and concealer.